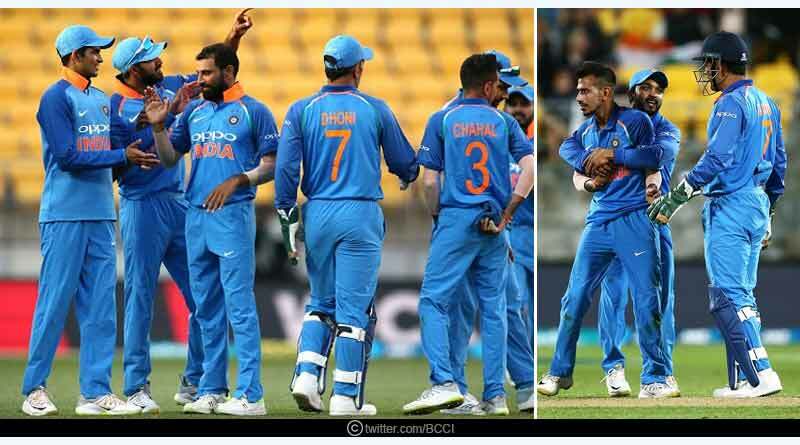 Coming back to New Zealand vs India fifth ODI match report, ever since India won the toss and opted to bat first on a pitch that had its fair share of covering; one that was expected to become a much better batting track come the evening, questions were raised over India’s decision. Captain Rohit Sharma had alluded the choice to put on a total, citing India’s need to test their side in such tough conditions ahead of the world but it seemed one that would cost them heavily as India sat on 18-4 in their sojourn to record their biggest ever series triumph in the country. However, granted an escape route into the match courtesy of some confounding captaincy by Kane Williamson and a murky bowling effort by the host’s bowling unit barring Boult yet again, India managed to get out of the skirmish they found themselves in, registering 252 on the good in a massive recovery by the tourists. Given a decent enough total to defend, the Indian bowling unit was on the money, sending down an incredible and illustrious effort to continue India’s supremacy in the country and come out on top by 35 runs. India went into the match with 3 changes with Mohammed Shami coming back to bolster the pace attack while Shankar came in place of Yadav as India opted to go in with four pacers for the first time this series. On the other hand, for the hosts, Munro returned to the side as they looked to build on the momentum gotten from a comprehensive showing in the last match and down India in the series. It was New Zealand who dominated the early exchanges of proceeding with Boult and Henry tightening the screws on the Indian top order with some effervescent and defiant bowling that saw them flourish. The line and length were exemplary, causing the move to move about in the air with such an ominous pace that India found themselves languishing for the second match in a row. 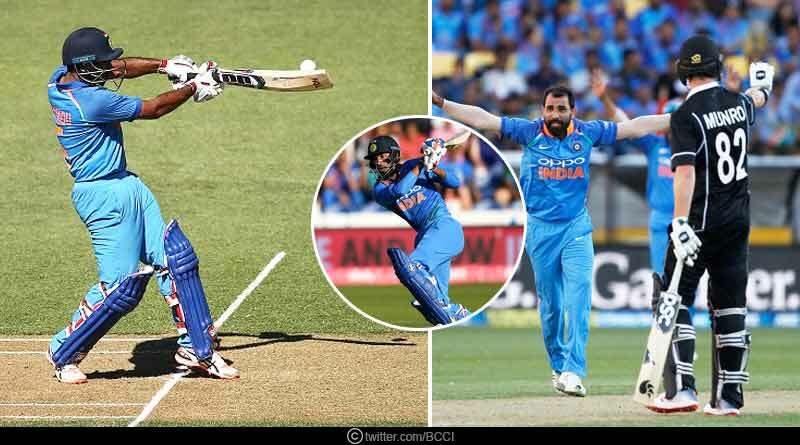 Captain, Rohit Sharma was the first to depart cleaned up by Henry with the ball going right between his bat and pad and following him soon after was Dhawan, with an irresponsible and ill-disciplined shot seeing the end of him. Gill fell next, playing a needless shot in the circumstances and with Dhoni departing soon after, castled by Boult’s incredible and flawless trajectory, the tourists were once again stuck in a pickle, all their own doing as the top order failed to take the accountability of setting a foundation for the middle-order yet again. Well on top and completely in control, Williamson seemed to lose his bearings from there on, allowing India to ease themselves back into the match. The fifth-wicket partnership helped steady the ship for India, coming at a tepid rate but more importantly ensuring that it left New Zealand flabbergasted, causing them to shift from their original plan and chase the game. Williamson’s game plan was an extremely quizzical one, one that saw him take off his best bowler in Boult, right at the moment India looked set to be decimated for under 100. It was a move that cost him and his side heavily come the final outcome with the lower middle-order having no trouble to take on New Zealand’s first change pacers, smashing the ball to all parts of the ground as the ball came on sweetly to the bat. A partnership that was going from strength to strength, reviving India’s innings, helping them reach 116 came to an unfortunate end with a complete breakdown in communication seeing New Zealand get a run-out. It didn’t help in the overall scheme of things though for them with India continuing to steady the ship, upping the ante after the initial objective was achieved with ease. Boult came back right before the final power play but it was a move taken too late by the New Zealand captain. The Indians who were just looking to add as many runs to their total from there on, threw their bat in everything, seeing the ball cross the short square boundaries of just 50m with relative ease, peppering the boundaries in the closing stages to put on 252. Coming out to bat, New Zealand knew they would have to be extremely cautious in their early approach against Shami and Bhuvneshwar if they were to win the second match of their series. Unfortunately for them, Munro and Nicholls decided to play out T20 style innings, going after everything in an extremely questionable move, helping India pick up three wickets within the first power play and give the visitors exactly the start they had fathomed. However, with Kane Williamson holding fort from one end, New Zealand found themselves maintain their footing in the encounter. He had started off extremely tentatively, failing to connect the ball as he usually does, mistiming a bunch of shots in the initial part of his innings but once in his grove, he started working the ball around, creaming it for the occasional boundary as well to shift the momentum in New Zealand’s favour. The 10-20 over period was one that New Zealand won comfortably, surprisingly showing more application when it came to facing the spinners. They were assured, not taking any unwanted risks, putting on a stand that looked to be underway to a second win on the bounce before everything fell apart for them to see them lose their final 7 wickets for just 112 runs. Williamson’s departure helped trigger for India’s a massive collapse in New Zealand’s following batsman after the well set in Williamson got out to a shot that was unwarranted at that particular stage. He failed to connect it as he would have liked to, failing to get the elevation needed to find out the fielder and depart for 39. From there on it was all India, as they kept peppering New Zealand with some absolute jaffers as things started unravelling for the hosts. It was yet another unsavoury and derogatory attempt at chasing down what should have been a comfortable target, one that was emphasised by the silly run out towards the end, bringing down the curtains on any chance New Zealand had of winning the match. For more articles like New Zealand vs India fifth ODI match report, do Subscribe to our newsletter and follow us on Facebook, Twitter and Google+.